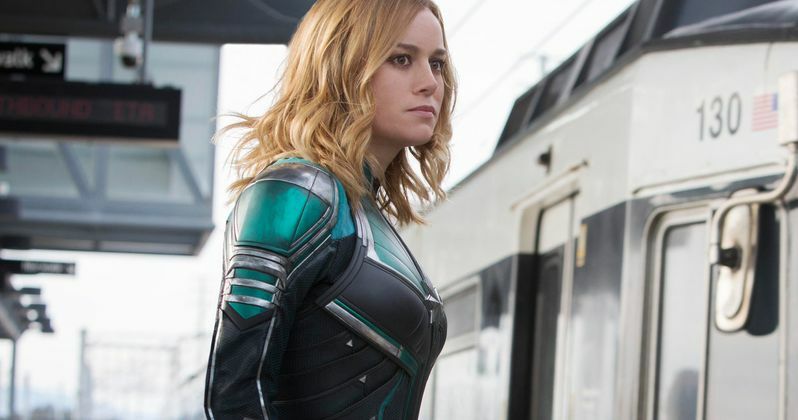 A new clip from Captain Marvel shows off more of the epic train battle from the last trailer. The first female-led Marvel Cinematic Universe movie is now about a month away from hitting theaters and fans are starting to get pretty excited. Earlier this week, it was revealed that the movie had screened and that Goose the Cat steals the show. While Goose isn't present in the new clip from Captain Marvel, it's still pretty great, which means that Goose isn't needed in every scene to make the movie awesome. Brie Larson talked with Ellen DeGeneres about Captain Marvel and brought along a clip from the forthcoming movie. We see Carol Danvers in her green Kree suit on top of the speeding train, which was originally teased in the trailers and leaked set photos. We see her getting ready to blast what we assume to be a Skrull. Following on the ground are the young Nick Fury and Agent Phil Coulson, who aren't letting Danvers out of their sight. The clip, while brief, is full of action and should get MCU fans pretty pumped. In addition to dropping off the clip, Brie Larson did some dancing to promote the Captain Marvel challenge, which is raising money for underprivileged girls to go see the movie for free. Ellen DeGeneres had Larson trying to emulate the dance moves that were going on behind her, starting with Madonna and going to NSYNC and Britney Spears. Larson did a pretty incredible job copying the dance moves and was able to raise a few thousand dollars for the Captain Marvel challenge in the process. Captain Marvel will not be a typical origin story, according to Marvel Studios boss Kevin Feige, and that is pretty evident from the promotional material that has been released thus far. Carol Danvers can't remember her past, which seems to show up in flashback form. Jude Law's mysterious character can be seen telling her to let go of her past, to which she says she can't even remember it. From there, Danvers is going to have to learn to harness her powers in order to become the strongest character in the MCU. With Avengers: Endgame coming out nearly right after Captain Marvel, MCU fans are wondering how and if the movie will help lead into the fourth Avengers movie. There will more than likely be at least a post-credits scene that might give us a clue about how Carol Danvers will be introduced when the time comes and maybe a hint as to how she can help battle Thanos. Time loops, time travel, and the Quantum Realm have all been rumored, with many suggesting that Danvers will be traveling from another place in time after getting the pager distress call from Nick Fury at the end of Infinity War. While we wait to find out, you can watch the clip and Brie Larson's dancing abilities below, provided by the Ellen Show YouTube channel.